Edit this Page via GitHub Comment by Filing an Issue Have Questions? Ask them here. Client devices are supported by Center IT (ADM, CRD, VIDD) as well as Division IT groups (BSD, HB, PHS). Please see Center IT’s page in CenterNet about Laptops and Desktops for more information about support for desktop computing. Note: If you request a Linux Desktop, Center IT will recommend that you use NoMachine from a Windows or Mac system instead as this is the most appropriate choice for most users but not all. If it is required for your work, it can be supported. Please see Center IT pages for more information on Mobile Device Services or contact Help Desk with questions or problems. We use 2 common protocols to access remote compute resources. The first is the Hypertext Transfer Protocol (HTTP). This is the way your browser communicates with remote web servers. The second common protocol is Secure SHell (SSH). This is the method used to run a program on a remote server. Typically the program run is a shell that gives you an interactive command line on the remote host. Many programs you will want to run on a remote compute servers are command line programs. These are easily executed from your shell remote process. You use this method when opening a terminal (shell) on a compute server (like rhino) and typing the name of the program or script. You may also need graphical output (GUI), for example to use tools like R Studio or advanced text editors. If the remote program has a Graphical User Interface (GUI) then you use a Windows-like system called X (or X11 or XOrg or officially The X Window System). The X Window System is backward from the way you may think it works - what you run on your laptop or desktop is actually the X server, and the remote program you want to display on your device is the client. All SSH clients support tunneling the X traffic, so usually you will use SSH to start the remote GUI program, which is then displayed on your device. Putty is the most widely used secure shell software for Windows. You can install putty through “Software Center” and then simply connect to host name rhino. The default Mac terminal is a good choice for connecting to and using SciComp Linux-based resources. We also recommend using iTerm2 for your local terminal program on your Mac- it has a richer feature set that comes in handy as your computing needs grow. The only X11 client for Mac is XQuartz. Install XQuartz before running any Linux X11 apps such as RStudio or Matlab. Go here, and download and install the latest version of XQuartz. After installing XQuartz just start the app. The XQuartz icon will appear in the toolbar showing that it is running. XQuartz is now running an X11 client and that is the only interaction that you need to do with XQuartz. After XQuartz is running, open the Mac terminal. The latest version of XQuartz sets the DISPLAY environment with the default Mac terminal window. We do not recommend using the terminal that comes with XQuartz. When connecting to a rhino with ssh always use the -X flag to forward your Xsession to your Mac. After connecting to a Rhino verify that your X11 client is working by typing xeyes. Terminator is a convenient terminal emulator that can have multiple terminals in a single window. You can use Terminator on your Linux desktop. Windows and Mac users will need a X11 software to use SciComp resources as graphical desktop. We recommend NoMachine NX to connect to a Linux machine with Terminator. SSH uses the TCP network protocol to make connections between systems. TCP is a persistent, stateful connection that is resilient to network interruptions. When you use SSH to run a program on a remote system (even a shell) the connection you make is tied to an SSH process on the remote machine, and all programs are children of that SSH process. If that process stops, all children stop as well. If the network connection does drop between your client and the server, your SSH process stops, and all your running programs stop. 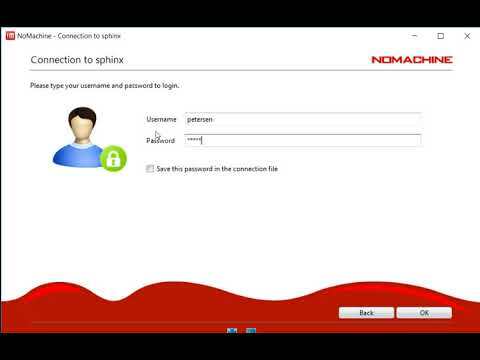 NoMachine NX is a remote desktop software for Linux servers that gives you full remote access to a graphical user interface from Windows or Mac clients. It is installed on the SciComp session Servers lynx, sphinx or manx which you use to access the rhino systems. To connect through the local Fred Hutch network or through a VPN connection please download and install the NoMachine Enterprise Client from NoMachine’s Site. Windows users can also install an older version from “Software Center”. One of the nicest features of NoMachine is that you can disconnect from the server’s desktop environment and later resume the connection and continue right where you left off with all terminal windows in the same place. NoMachine from Windows or Mac is often a better choice than installing a Linux desktop. GNU Screen and tmux are both terminal multiplexers. They run one or more shell processes on a remote system and enable you to disconnect and reconnect while leaving the process(es) running. They are both full-featured utilities that take a long time to learn. Using the command below, you can get working with tmux quickly. A note about tmux iterm2 integration. If you are using iterm2 on a Mac, add -CC to your tmux command. This will run a tmux console as well as tmux in that terminal. From there, you can use iterm2 commands to create a new tmux sessions in a new window (command-n) or a new tab (command-t). When you disconnect, simply reattach to that first tmux session, and iterm2 will re-open all your windows and/or tabs. A note about the X Window System and terminal multiplexers. As stated above, on your laptop you are running an X server, and the remote program is a client. Terminal multiplexing allow your laptop to disconnect because the multiplexing server is running on the remote system and your device is the client. When you close your laptop, the X server stops. Clients exit at that point as a client cannot do anything without a server. See NoMachine for a workaround for X programs. Located in your home directory in the .ssh folder is a file called config (create it if it doesn’t exist). Your SSH client will read configuration options from this file when you use it. Any of the command line options can be specified in this config file to avoid overly complex SSH commands. This is what this page is all about. You must start from a client that is running an X11 server. These include any Linux system including NoMachine, XQuartz on MacOS, and Xming or Cygwin on Windows. 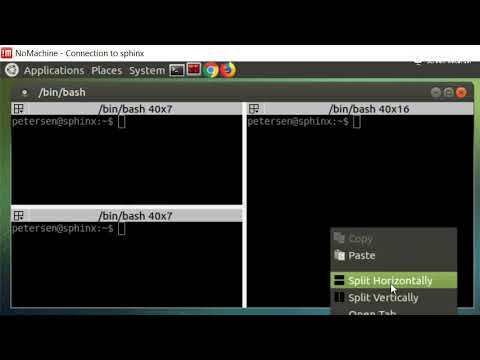 ForwardX11 -X yes/no This will instruct your ssh client to set up a tunnel between the X11 server on your client device and a port on the remote machine. This port is specified by the DISPLAY environment variable. ForwardTrustedX11 -Y yes/no Trusted X11 connections bypass X11 security features. The traffic is all still encrypted, but root on the remote machine may be able to access your client device. Some SSH implementations do not support X11 security extensions, so you must specify -Y or ForwardTrustedX11 to bypass them. Check on the remote system that you have a DISPLAY environment variable set using echo $DISPLAY and test X11 itself by running a simple X11 program like xeyes. Often the local user on your client device is not the same as your username on the remote system. You can always ssh joeuser@remotehost.com but you can also specify that in the config file. User @ Your remote system username Make ssh commands shorter and easier. Identity -i SSH supports multiple identities and multiple keys. Use this option to specify a different SSH key from the default ~/.ssh/id_rsa. If you use your password to ssh, you can certainly continue to do so. However, with a key you will have to type your password less frequently, or sometimes never. Many remote systems do not allow password authentication and require keys. Create an SSH key - on MacOS or Linux, run ssh-keygen and follow the prompts (change the file location if you are creating a new key but want to keep the old one). On Windows you will need puttygen if using puTTY or copy the Linux way if using Cygwin. You will be prompted to enter and then confirm a passphrase. This is the best protection of your ssh key, and should be a longer complex passphrase. See below to automate the use of it, and try to resist creating passphrase-less keys. This command will create two files in ~/.ssh - id_rsa and id_rsa.pub. The first is your private key, and the second is the public key. No one wants to type a long passphrase every time they use SSH. Creating an SSH key with no passphrase is unsafe. MacOS keychain to the rescue. The following steps will get your MacOS device into a state where your SSH key passphrase is unlocked for you when you log into the Mac, and is automatically supplied to SSH. You will need to be logged in to your Mac, have a terminal open, and have an SSH key to start. Add your ‘key’ to the keychain - run ssh-add -K <path to keyfile> the default is ~/.ssh/id_rsa. This will prompt for your passphrase, and then store it in your login keychain. UseKeychain -o UseKeychain yes/no So not all config options have easy command line options. This tells your ssh client to use your keychain for the passphrase. AddKeysToAgent -o AddKeysToAgent yes/no Starts and ssh-agent process that will hold your unlocked key safely in memory for subsequent ssh session. Shutdown or reboot and this disappears. Your SSH key is actually in two parts - the public key, and the private key. Public/Private key pairs are fascinating if you are in to encryption. Be sure to search and read all about them. Your SSH public key is not secret. It can and should be distributed. Typically your public key is added to your ~/.ssh/authorized_keys file (just add it to the end). Also, if there is a public key file in ~/.ssh on the remote system, that will work. You can email this, paste it, whatever. The trust is on the other end - any remote system that accepts your public key in agreeing that it identifies you. Protect this. This is how you prove you own the public key. It is best to not put this anywhere other than your client device, and perhaps a backup if you like, though no lasting encryption will be done with it, so losing it will not destroy any data. SSH supports an in-memory agent process that will hold your unlocked private key safely. This alleviates the need to type your passphrase for the duration of time the agent is running. See above for MacOS options. On Linux, you can run eval $(ssh-agent) to start an agent, and ssh-add [path to keyfile if not default] to add your key to the running agent process. ForwardAgent -o ForwardAgent yes/no Forward agent requests back to the agent running on your client device. Your SSH config supports multiple ‘stanzas’ to help you as your config may not be the same for remote hosts. The ‘stanza’ keyword is Host. In the example below, everything from one Host line to the next Host line is applied the specified host. This config contains all of the features mentioned above and will apply them to all fhcrc.org hosts. It will use snail (the SSH gateway host) for all hosts except snail itself, as this would create a loop. Obviously you would replace your identity file path and username if needed. One final note - SSH does not do DNS resolution before consulting the config file, so typing ssh rhino will not trigger the *fhcrc.org Host entries. You can add rhino to the Host line to have this trigger the config as well. Fred Hutch supports use of a VPN to remotely connect with our network. The network is protected by a firewall and there are currently 2 options to get access to resources inside the network, using VPN or the SSH gateway snail.fhcrc.org. This is allowed as all SSH communication is encrypted, and the gateway system is audited. SSH supports using a proxy or “jump host” and can be configured to do so automatically. ProxyJump -J hostname SSH will use the specified host as a middle-point before completing the connection to your desired host. The Fred Hutch desktop VPN service is the default choice for all remote connections. Please see the VPN page on CenterNet for more details. If you are outside the Fred Hutch network type ssh rhino.fhcrc.org to use the snail gateway and if you are inside type ssh rhino to bypass the gateway. Please see this page to learn more about ProxyCommand. © 2019 Fred Hutch Biomedical Data Science Wiki. Powered by Jekyll & Minimal Mistakes.